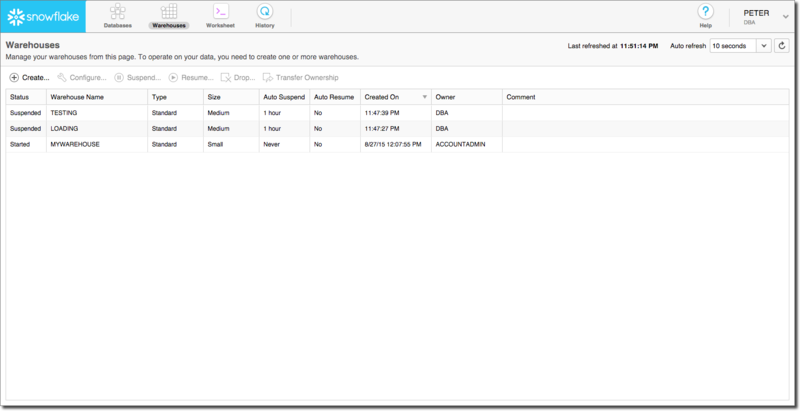 Once you have logged into the Snowflake web-based graphical interface, you can create and manage all Snowflake objects, including virtual warehouses, databases, and all database objects. 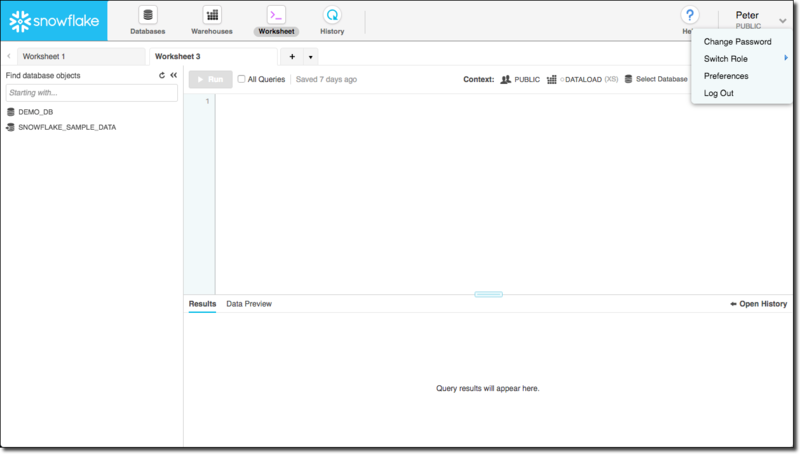 You can also use the interface to load limited amounts of data into tables, execute ad hoc queries and perform other DML/DDL operations, and view past queries. And the interface is where you can change your Snowflake user password and specify other preferences, such as your email address. In addition, if you have the required administrator roles, you can perform administrative tasks in the interface, such as creating and managing users. For more information about the administrative tasks you can perform, see Managing Your Snowflake Account. Create, clone, or drop a database. Transfer ownership of a database to a different role. Create or drop a warehouse. Suspend or resume a warehouse. Transfer ownership of a warehouse to a different role. 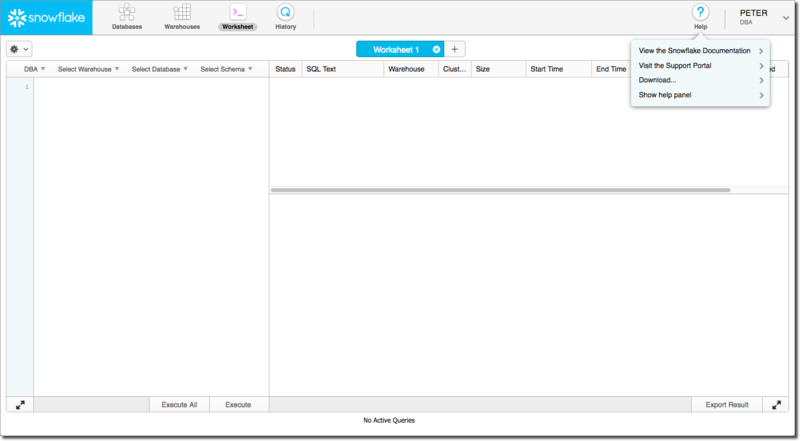 Run ad hoc queries and other DDL/DML operations in a worksheet, or load SQL script files. Open concurrent worksheets, each with its own separate session. If you log out of Snowflake, any active queries stop running. If you’re in the middle of running queries when you refresh, they will resume running when the refresh is completed. Resize the current warehouse to increase or decrease the compute resources utilized for executing your queries and DML statements. Export the result for a selected statement (if the result is still available). For more details, see Using Worksheets for Queries / DML / DDL. Filter queries displayed on the page. Scroll through the list of displayed queries. The list includes (up to) 100 queries. At the bottom of the list, if more queries are available, you can continue searching. Abort a query that has not completed yet. View the details for a query, including the result of the query. Query results are available for a 24-hour period. This limit is not adjustable. Change the displayed columns, such as status, SQL text, ID, warehouse, and start and end time, by clicking any of the column headers. For more details, see Using the History Page to Monitor Queries. View the Snowflake Documentation in a new browser tab/window. Visit the Support Portal in a new browser tab/window. Download the Snowflake CLI client (SnowSQL) and ODBC driver. View download info for the Snowflake JDBC driver, Python components, Node.js driver, and Snowflake Connector for Spark. Show help panel with context-sensitive help for the current page. You can then change your password or security role for the session (if you have multiple roles assigned to you). 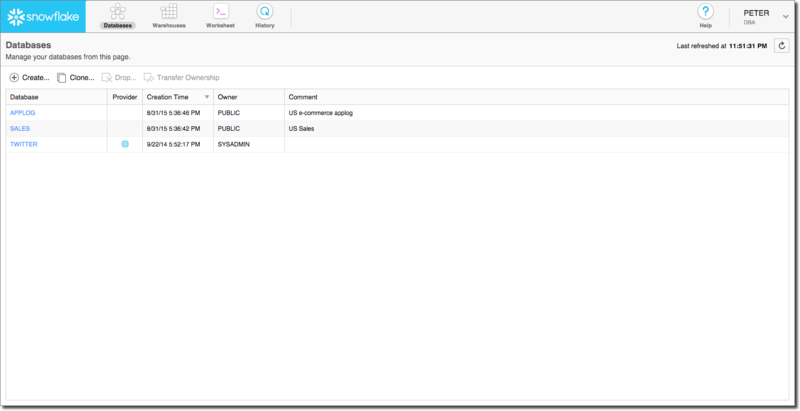 For more information about security roles and how they influence the objects you can see in the interface and the tasks you can perform, see Access Control in Snowflake. Set your email address for notifications (if you are an account administrator). Close your current session and exit the Snowflake web interface. When you exit the interface, Snowflake cancels any queries that you submitted during this session and are still running.